First shown in 2005, Something Special on Cbeebies is designed to interest and unite children who may have certain learning difficulties. By using the Makaton language programme within the show, kids of all abilities love the antics of Mr Tumbles and the items in his spotty bag. The show is presented by Justin Fletcher who also plays some of the shows other characters. As a firm favourite with kids all over the UK, Mr Tumble is recreated into a toy by the clever designers at Golden Bear. This soft squeezy toy is perfect for all preschoolers who regularly tune into the show. 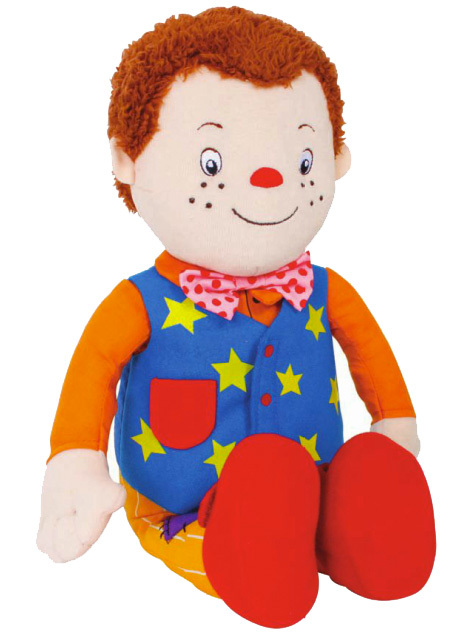 Featuring some of Mr Tumble’s phrases when his hand is squeezed, his nose also lights up and he has a tactile rattle in one of his hands. Golden Bear have also created a Something Special Mr Tumble Phone, as well as a Pick n Match Pairs Game with 36 flash cards and a Mr Tumble tea set. Jumbo Games have also joined the licence with an assortment of jigsaw puzzles and a floor game.